The Western Front in the “Great War” was at a virtual stalemate. German troops faced a combined Allied force of French, British and Belgium soldiers along a 400-mile-long trench line, with neither side able to make significant, sustained advances. In April 1917, three years after the war began, America entered the conflict on the side of the Allies. As the nation had a small army, this required a major expansion of its forces through the federalization of National Guard units, recruitment, and the initiation of compulsory service. With the rapid growth in troop size, the number of chaplains to minister to these troops was woefully inadequate. The Church hierarchy knew of only eight Catholic chaplains in the entire army. The Knights of Columbus previously had established centers on domestic military posts to provide recreational and spiritual activities for the troops. Now they obtained permission from General Pershing, commander of the American Expeditionary Force, to provide Catholic priests to serve as volunteer, civilian chaplains. Fr. John B. DeValles was one of the first five priests to leave for France as a Knights of Columbus chaplain, arriving in September with the first National Guard units. These doughboys, newly mobilized and inexperienced, received several months of training in methods of trench warfare, procedures for gas attacks, and the techniques of using grenades and bayonets. Now, as spring approached, they were ready to gain front-line experience. The Americans would relieve French units in areas that were relatively quiet. Fr. DeValles was attached to the 104th Regiment of the 26th Division, known as the Yankee Division, which was composed of National Guard units from throughout New England. The chaplain quickly exhibited his concern for the men and his courage. On March 11, 1918, while still in a reserve capacity, his unit came under heavy shelling. Fr. DeValles choose to remain with the wounded when they could not be moved to a safe area. In April, the 104th Regiment was replacing a veteran French unit in the Bois Brule, near the village of Apremont. Another French unit remained on its left. The terrain was rugged, the trenches assigned to the Americans were in poor condition, and the land marshy making drainage difficult. In the distance, Mont Sec gave the enemy a splendid vantage point to observe the U.S. area. On April 5, and continuing for five days, there was heavy shelling of the American position. Then, in the predawn hours of April 10, the bombardment intensified. With first light, the enemy came over a hillcrest in a relentless assault. The U.S. troops, forgetting much of their newly-learned techniques, battled fiercely, repelling the veteran German soldiers. On the night of the 11th, the Americans checked another attack. The following day, the enemy came again. The French pulled back, exposing the U.S. left flank, but a vigorous counterattack by the Americas regained the ground the enemy had taken. Fighting continued sporadically on the 13th, and then stopped. For four days, Fr. DeValles virtually lived in “No Man’s Land,” an area pitted with shell holes and strewn with barbed wire, broken trees and other war-torn detritus. Ignoring shelling and machine-gun fire, he comforted the wounded, helped carry those who could not walk to aid stations and ministered to the dying, making no distinction between friendly and enemy soldiers. He was indefatigable. When his hands were numb and could no longer grip the handles of a stretcher, he tied telephone wire around his wrists and looped the ends over the bars. Several days after the battle, the French awarded the 104th Regiment the Croix de Guerre for its bravery and achievements. This was the first such award to an American unit. Fr. 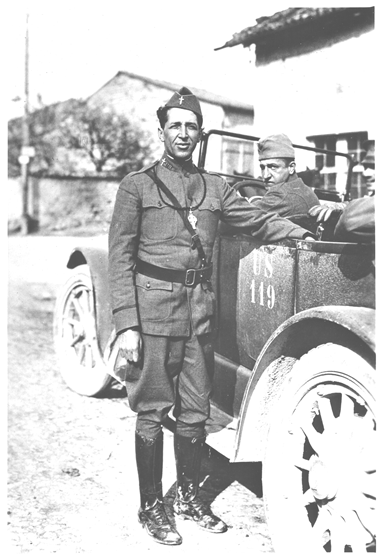 DeValles received the same award, being citied for his “extraordinary heroism and exceptional devotion to duty, under uninterrupted fire and the constant risk of his life.” He became known as the Angel of the Trenches because of his zeal and charity in caring for the injured and dying. For the remainder of the year, the Division took part in major offenses at Aisne-Marne, St. Mihiel, and the Meuse-Argonne. Fr. DeValles remained on the frontlines. At one point, outside of his dugout in a trench, he placed a handmade sign that read, “Fr. John’s Office,” indicating that he was always available to the men. In July 1918, his request was approved and Fr. DeValles was appointed a chaplain in the regular army with the rank of 1st lieutenant. After one engagement, he was found unconscious and wounded, lying next to a dead soldier he had been trying to help. He was to be sent home, but refused and insisted on being treated in France so that he could be near his men. When partially recovered, he returned to the regiment. Several months after the fighting ended with the Armistice on November 11, 1918, Fr. DeValles sailed for America with his unit. Joao Baptista DeValles was born in 1878 at San Miguel, Azores, and emigrated to New Bedford, Massachusetts, at the age of two. After college, he entered the seminary and in 1906 was ordained a priest for the Fall River Diocese. With knowledge of six languages, he served in several parishes, including Espirito Santo, where he established the first parochial school in America for Portuguese students. Then, with his bishop’s permission, he volunteered as a Knights of Columbus chaplain, when the U.S. entered World War I. His medals -- French Croix de Guerre, Legion of Honor and American Distinguished Service Cross – and uniform reside today in the Order’s museum in New Haven.